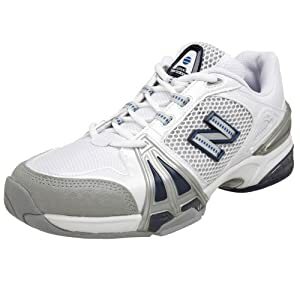 New Balance offers great feel, good grip and excellent support with this stylish top-performance tennis shoe, ideal for the quick and aggressive player. Constructed with a light and breathable synthetic/mesh upper, the shoe is loaded with high-tech features designed to keep you comfortable, dry and at the top of your game. The shoe is designed with durability in mind, no matter what surface you play on, and also includes wear-resistant features like an enforced drag tip that lets you focus on your serve and not your footwear. The New Balance ® 1004 men’s tennis shoe is crafted using a lightweight combination of synthetic and mesh for optimal support and breathability. Abzorb ® SBS cushioning attenuates shock on impact, and the N-durance ® outsole provides dependable traction on the court.